This was a very fun and interesting session, and I really enjoyed working through the ECGs using the systematic approach that Dr. Loewen taught us. 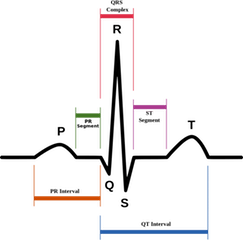 I still find it challenging to read ECGs, especially ones that are not very clean or straightforward, but will aim to avoid reading the interpretations on the top of the ECG and developing this skill in future rotations! Picture of the atria and ventricles simultaneously! These make sense as “anterior” leads → think of location of the leads (see pic below)!